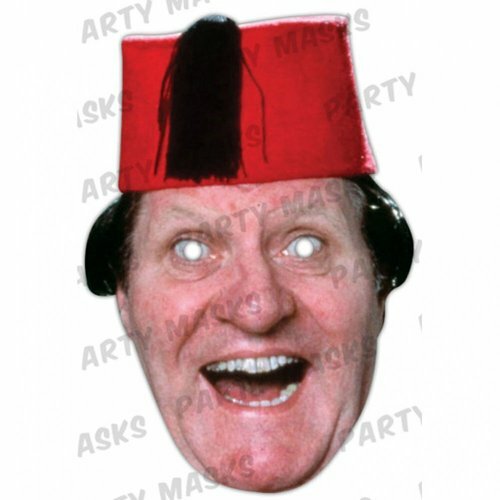 Born in Caerphilly, Wales, on March 19th, 1921, Tommy Cooper had an appearance which gave him a head start in comedy. Going into showbusiness in 1947, Cooper landed several television spots from the early 1950s onwards, including appearing several times on American TV on the prestigious 'The Ed Sullivan Show', firstly in 1963. Tommy Cooper's first television series, 'Cooperama', was screened by ITV in 1966, and Cooper's hour-long shows on ITV in the 1970s were to make him even more popular. Much imitated, and his "Just like that!" catchphrase up among the most famous of all, Tommy Cooper even found his name on John Lennon's Plastic Ono Band's legendary 'Give Peace A Chance' in 1969. Such was Tommy Cooper's eccentricity, even his death seemed unbelievable at first, when he collapsed and died of a heart attack live on British TV at Her Majesty's Theatre, London, on April 15th, 1984. Many thought it was another Tommy prank. Tommy Cooper was a fez-wearing genius, who only had only to give one of his gormless looks to have this particular viewer in stitches. He was a gifted magician, but it was the incompetent brilliance of somehow beguiling the audience into thinking he didn't know what he was doing, then pulling off the trick, which was the masterstroke. Tommy Cooper was unique - in a world full of supposed unique performers who weren't really. "I slept like a log last night; I woke up in the fireplace." "I'm on a whisky diet; I've lost three days already." "I backed a horse today at 20 to 1. It came in at twenty past four."